Herbal Mud Face Mask to promote a youthful looking skin. Our Herbal Mud Face Mask is a blend of thermal mud with oligoelements, kaolin and herbal as well as botanical extracts and cover the entire spectrum to promote a smoother, finer, younger-looking and more vital skin. Very few masques contain the same amount of active ingredients as we included in this formulation. Our Herbal Mud Face Mask can be used on any skin type, and will also help if you suffer from skin problems. Not only does it fight inflammation and other minor infections, but also helps the skin to repair sun damage and photo aging, while restoring the suppleness and firmness of the skin. The other herbal and botanical extracts help the skin to rejuvenate and regenerate by boosting and supporting the collagen and elastin in the skin, which not only helps to lessen wrinkles and lines, but also pro-actively works towards preventing them in the future. Anybody that is concerned about the way they look, and wish to have a well-groomed look - be that male or female - should use a facemask at regular intervals to support and encourage a healthy skin and to fight the signs of aging for as long, and best, as possible. Our Mud Face Mask has an unique and extraordinary formula, in which a blend of various pure herbs and natural ingredients are combined to create this remarkable product. It contains the following herbs and natural ingredients: almond, aloe, centella, jojoba, kaolin, MSM, olive leaf extract, rosehip, soy, tea tree leaves and thermal mud with oligoelements. To place these herbs in perspective, and the reason for their inclusion in our Mud Face Mask, we have included a short summary of each ingredient used. For more information on each individual ingredient, please click the hyperlinked text. Cleanse the skin with Ageless Herbal Face Wash and pat skin dry. 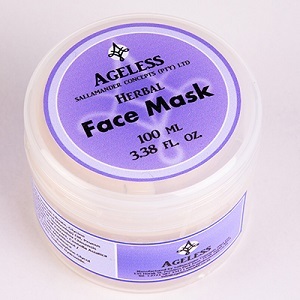 Apply Ageless Herbal Mud Face Mask evenly over the face and neck area, avoiding the eye and lip area. Relax and leave on for 15 - 20 minutes, then wash off with tepid water and pat dry. Apply Ageless Herbal Day or Night Cream. Use the Ageless Herbal Mud Face Mask every 2 - 3 weeks, or every week in extreme cases. Once a week I take time off from my busy schedule and pamper myself and my skin. This is when I use your facemask, as I have not found another one that help my skin looking as fresh. After the mask my skin looks less tired, lined and has a rosy glow. Boosts the skin's vitality and helps prevent minor skin problems.